Continuing from my last post on Asakusa, this post will be about my adventure at the Tokyo Skytree tower. As I have mentioned before, the Skytree tower is really close by Asakusa and you can always walk there instead of taking the train. And I'd recommend walking because it saves money and you also get to see and explore the area. I walked there in about 20 minutes and I didn't even use Google map GPS to guide me. I basically just walked in the direction of the Skytree tower and I got there without any problems! I walked across the Sumida River and passed the Asahi Beer Tower and also came across the famous Kani Doraku (かに道楽) restaurant with the iconic moving crab! Under the Skytree tower, there is a shopping mall called "Tokyo Solamachi" where there are over 100 different shops and restaurants. There is also a small aquarium as well. I didn't get to shop much at the mall because I spent most of my time up on the Skytree Tower so by the time I finally came down from it, it was already nearly 8pm and the shops at the mall closes at 9pm. 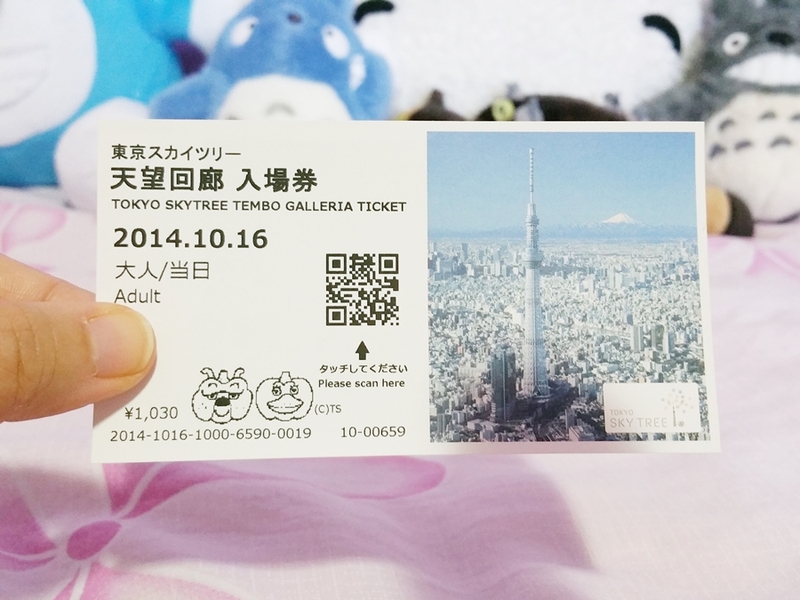 Be prepared for the long lineup to buy tickets to go up in the Skytree Tower. Skytree Cafe. I bought the Sky Soft ice cream and a latte. View up on Tokyo Skytree tower during the day. I got up the Skytree tower around close to 4pm so I got to see both the day and night view of Tokyo. This is the view from the first observatory deck at 350m high. You can spot the Asahi Beer Tower and Sumida River in the last picture. After I finished eating my ice cream and drink, I headed up to the second observatory deck up 450m high and watched the sunset and waited for the whole city to turn dark and the lights from the buildings all light up and it was such a pretty and romantic view! There are these computer screens that you could place your finger and touch an area in the picture map and it gives you a close view of the area and tells you about any famous/popular buildings within that area. There are also other picture maps posted around the observatory with landmark information on each side view from the Sky Tower from north, south, west and east. A 360 view of Tokyo City! One of the main highlights of going up the Skytree tower for me was being able to see Tokyo Tower in a different colour than orange. 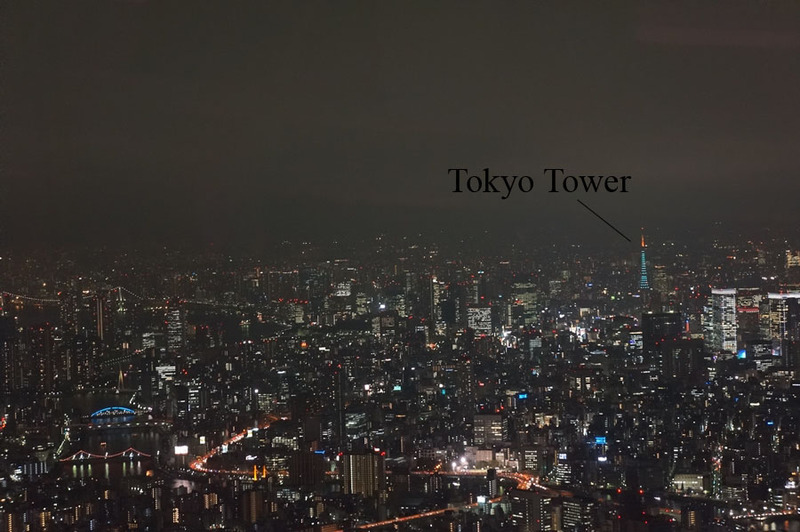 The Tokyo Tower is usually always light up in orange during normal days but that night when I happened to be on the Skytree tower, it was light in a special colour and I was soooo lucky to be able to see it. Even some of the local Japanese citizens next to me were very surprised to see the Tokyo Tower light up in a different colour other than its usual orange lights. It definitely made my visit to the Skytree tower much more special, lol. Here's a picture of a closer view I got from google of what the colour lights look like at the Tokyo Tower. It is only light up in this colour on special days and events. More night view shots later in the evening. Merchandises from the Tokyo Skytree shop! I bought one of the small light stands of the tower that changes into 6 different colours. A view of the Skytree tower from the bottom at night with the blue lights! It actually looks really magnificent in person and makes you feel like as if you're in a futuristic world out of space when you look at it. There is a planetarium theatre on the 7th floor at the Tokyo Solamchi mall which I have wanted to go to but it was already so late and I didn't want to head back to the hotel so late at night. I'd like to come back to the mall again during my next Tokyo trip to shop around the mall and go to the planetarium theatre. Tokyo banana cakes! I didn't buy any home but I did get to try some. I had very little time to shop around the mall as most shops were already closing but I did get to go to the Hello Kitty shop at the mall. I'm not even a fan of Hello Kitty but I thought I would take some pictures to share on my blog for all the Hello Kitty lovers out there, lol. I wanted to visit the Rilakkuma shop and Studio Ghibli shop at the mall more but I didn't have enough time to go there. Next time I will definitely make a visit to those two shops! 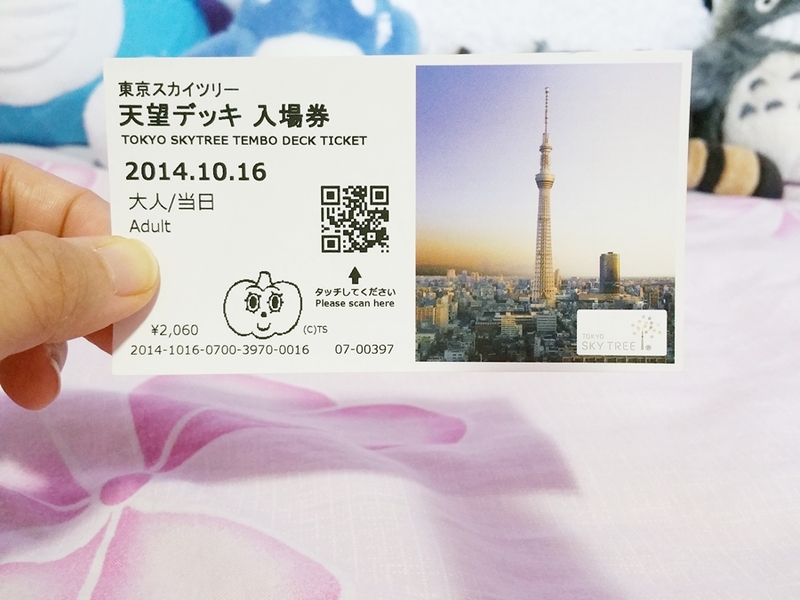 My Skytree tower tickets. It cost 2,060 yen ($20 CAD) to go to the first observatory deck and another 1,030 yen ($10 CAD) to go up to the second observatory deck. 1. From Asakusa Station, take the TOBU SKYTREE Line and get off at Tokyo Skytree Station. 2. 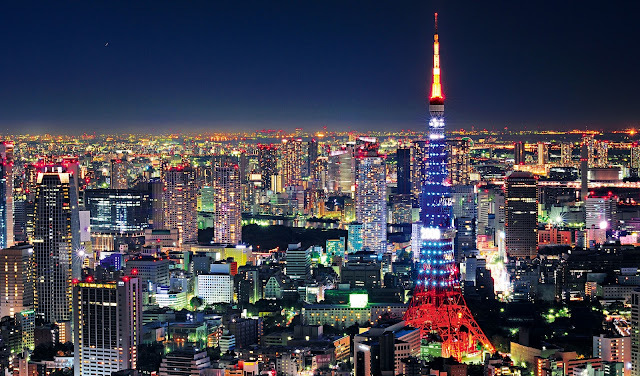 From Ueno Station, take the Tokyo Metro Ginza Line to Asakusa station and then transfer to the TOBU SKYTREE Line at Asakusa Station and get off at the Tokyo Skytree Station.